Special pickup day / time are available by appointment on other weekdays. There is no better way to learn about who we are and what we do than to experience it for yourself. Come and visit us in our Factory Store where you can witness our entire bean to bar process while enjoying complimentary samples and browse through our entire collection. Or book a session in our Experience Tasting Lab, which is a great way to spend a fun weekend afternoon learning, tasting and/or pairing cocoa bean to bar chocolate. We look forward to meeting you! 'The Atelier' Factory Store is located in our Cocoa Bean Chocolate-Making Lab where we produce Hand Made chocolates in Richmond [Metro Vancouver, BC area]. Visitors can view first hand how premium cocoa bean-to-bar chocolate is crafted in micro-batches. The Factory Store minimalist setting features 12' high ceiling, white walls and white floating shelves similarly to that of an art gallery where our cocoArt and other products are the only point of focus. 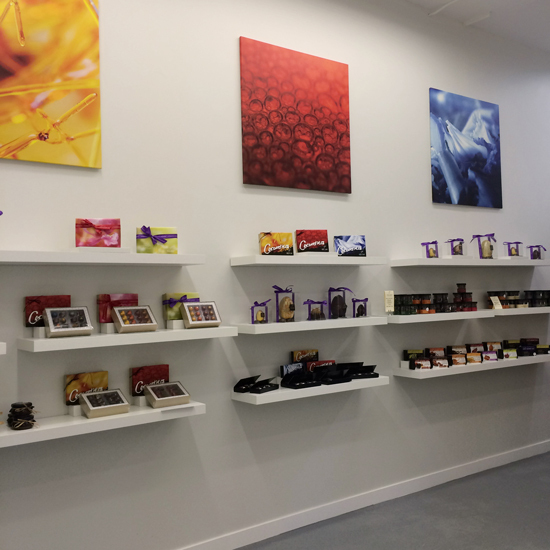 Our non-traditional factory store location and limited opening hours allow us to offer 'out-of-this-world' acclaimed chocolates and desserts products at highly competitive pricing. All products listed in our Online Store are available to purchase in the Factory Store. Note that we offer a 20% Off Rebate on orders placed online for pickup - enter the PICKUP code at checkout for the discount. Note also that all Designer Cakes & Cream Puff Desserts are exclusively made to order and can only be purchased via our Online Store for collection at the Factory Store. Orders must be placed with minimum 24 hours notice depending on product. On days that the Factory Store is not open, special pickup arrangements can be made By Appointment via email or call 604-765-9507. Our tasting tours & events Experiences are presented by the chefs/owners of Wild Sweets® – Dominique & Cindy Duby - who know chocolate inside out! A rare and unique opportunity to 'Meet The Makers' and Explore their novel world of chocolate and Experience their hyper-creative sweets, which made them One of the ‘25 Best Chocolatiers in the World’. The format is fun, informal, interactive and ‘Edutaining’ with a focus to delight your taste buds with all things chocolate from cocoa beans to finished haute chocolate in various forms from single origin bar to gastronomical multi-courses experiences! All sessions are held in our Cocoa Bean Experience Tasting Lab in Richmond [Metro Vancouver, BC]. Ample free visitor parking at the location. The Atelier is only 28 minutes away from Downtown Vancouver by car! We're also located close to historical Steveston fishing village, an attraction in the Lower Mainland.